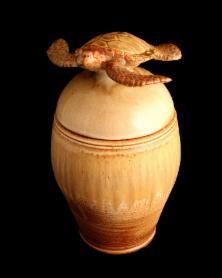 I have been handcrafting coastal themed stoneware pottery for over 46 years. In our studio on Amelia Island, wheel thrown, hand built and sculpted vases, bowls and platters come out of the fire as sea turtles, fish and manatees in a variety of beautiful glazes that will enhance any decor. My work is available in a variety of locations including Fernandina Beach / Amelia Island, Saint Augustine, Savannah, Saint Simon's Island, Jekyll Island, Mount Pleasant, Hampton VA, the Outer Banks and Maui Hawaii. Click on 'Where To Buy' to see a full list of shops and Galleries. A few years ago, I changed the name of our studio from Jones Pottery to Amelia Island Pottery in order to better reflect our location and the style of my work. More recently we shortened the name to ISLAND POTTERY which we think fits our work even better (and doesn't confuse our patrons in Hawaii). Living on Amelia Island, the highlight of my morning is sitting on the back porch with my wife Pat, enjoying the serenity our island home, listening to the surf in the distance while sipping fresh ground Hawaiian KONA coffee from a mug that was made over 40 years ago by my friend and mentor, master potter Lee Shank. I want you to be able to experience that same feeling of satisfaction with one of my handcrafted ceramic items. Many of my pieces are destined to become heirlooms and with minimal care they will give lasting pleasure and enjoyment for generations. Please browse this site where you can learn about my process,find locations to see and purchase my pottery or even select a piece to mail order from the 'Photo Gallery'. My goal is for you to enjoy my work as much as I do in making it. . . .